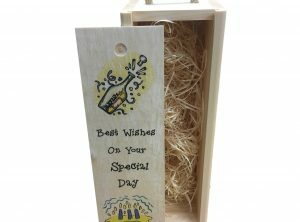 18th Birthday Wine Box make the perfect keepsake box for any 18th birthday party gift. This box comes presented with wood wool to aid the presentation of your standard size 750ml, wine, spirit or bottle of champagne. Wine boxes can come as a standard stock designs as pictured or personalise this wine box with any message or message and photograph. 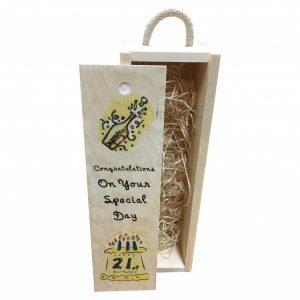 21st birthday wine box makes the perfect keepsake box for any 21st birthday party gift. 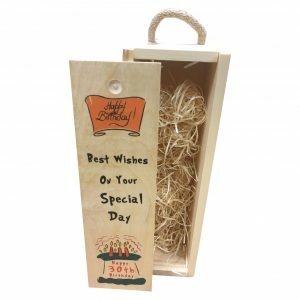 30th birthday wine box makes the perfect keepsake box for any 30th birthday party gift. 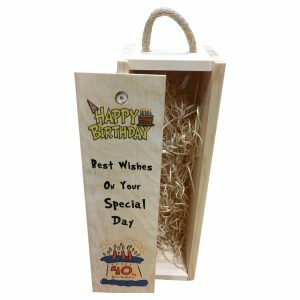 40th birthday wine box makes the perfect keepsake box for any 40th birthday party gift. 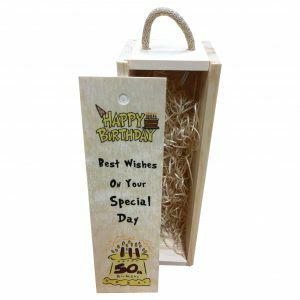 50th birthday wine box makes the perfect keepsake box for any 50th birthday party gift. 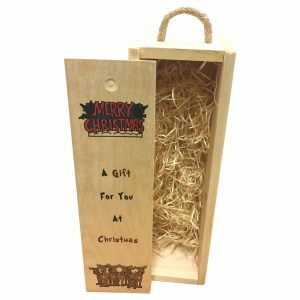 A gift for you at Christmas Wine Box. This box comes presented with wood wool to aid the presentation of your standard size 750ml, wine, spirit or bottle of champagne. Best Man Boxer shorts available in a choice of 2 colours Black or White. Best Man appears printed on the reverse of the shorts. 95% cotton / 5% elastane. Elasticated waist with contrast tipping. 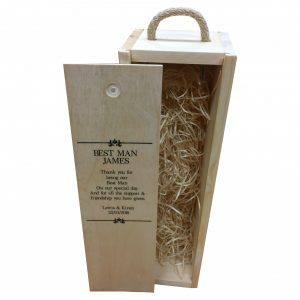 Personalised Best Man Wine Box makes the perfect presentation box for any standard size 750ml, wine, spirit or bottle of champagne. This box comes presented with wood wool to aid the presentation of your selected bottle. 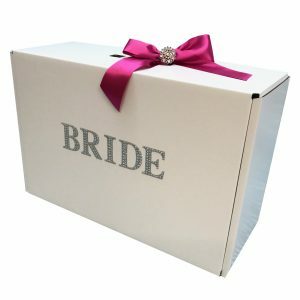 This wine boxes can be personalised with any message which makes this gift a unique and special gift for your Best Man. 800ml Black personalised water bottle. 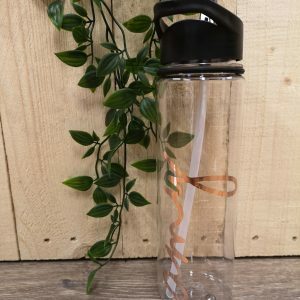 This plastic black trim drinks bottle can be personalised with a name can be printed with several print colours. 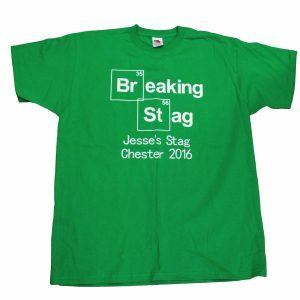 Breaking Stag T-shirt can be personalised with the stag’s name, you can also personalise this t-shirt with a name /nickname on the reverse. 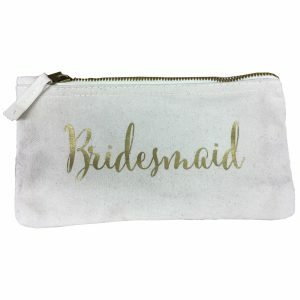 This bridal zipper pouch makes a lovely gift for any member of the bridal party. 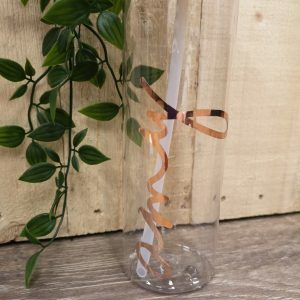 Personalise it with any role, Bridesmaid, Bride, Maid of Honour, Mother of the Bride & Mother of the Groom etc. 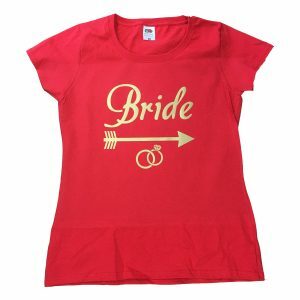 Bride arrow ring t-shirt available in a choice of colours. Personalise this t-shirt with a name/nickname on the reverse if required. 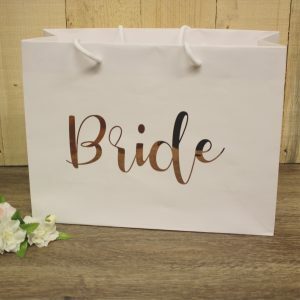 This beautiful gift bag is an ideal way to say thank you to your bride or bridesmaid for being with you on your special day. Adding small gifts to this gift bag is a great way to show them how much they mean to you. The satin rope knotted on the bag is a perfect touch to this gift bag. 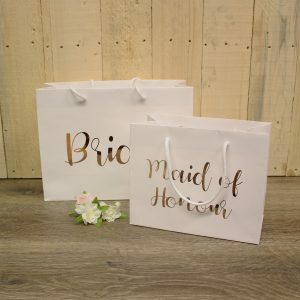 To make this gift bag extra special you can personalise the text colour and the bag colour too. 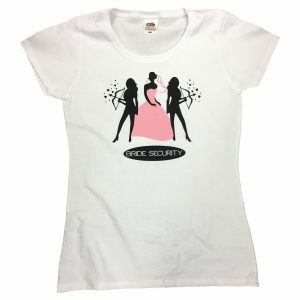 Bride securty t-shirt is a silhouette design of 2 security personal looking after the bride pictured in the middle. If you require any further personalisation below the design please fill our front print and leave blank if not required. Personalisation or a name/nickname can be added to the back for an additional £2.00 per shirt. 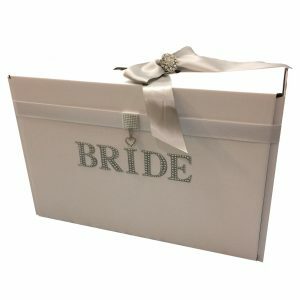 Yes this Bride show stopper travel box is truly stunning! Now our brides can ‘Dazzle Em’ at the airport, on the plane and in the resort with our delightful jewel encrusted Travel Box. 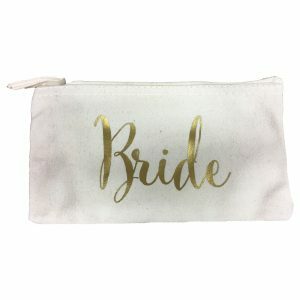 Be the envy of all other brides and watch them grab their sunglasses to protect their eyes from this delightful sparkling box. This box is finished by hand. 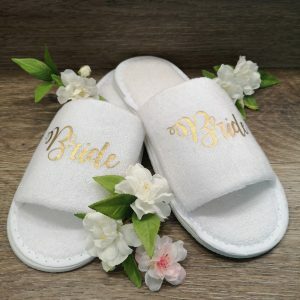 Cosy open toed slippers ideal for every bridal party member. 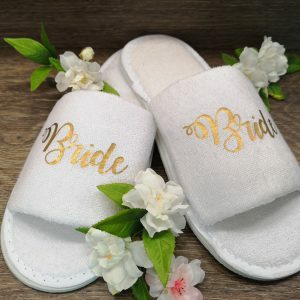 Makes the perfect add on gift for your hen pamper party or for that last minuet pedicure. Slipper available in one colour with a selection of print colours. 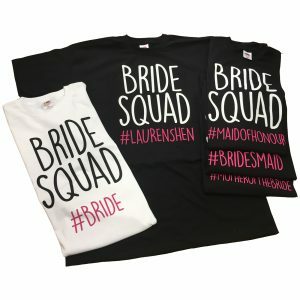 Bride squad hashtag t-shirt available in a choice of colours. Personalise this t-shirt with a name/nickname on the reverse if required. 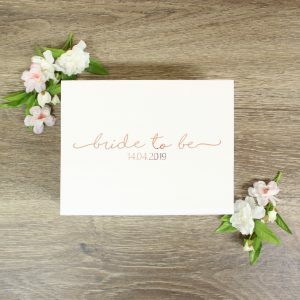 This beautiful snap shut gift box is a perfect way to say thank you to your bride or bridesmaid for being with you on your special day. Adding small gifts to this box is a great way to show them how much they mean to you. The pretty ribbon tab allows easy opening. 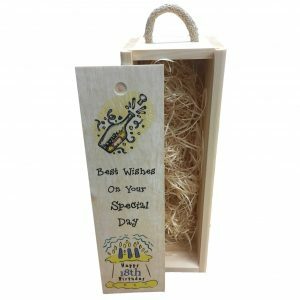 To make this gift box extra special you can not only personalise the date but the colour of the writing and the box too. Please note that all measurements are internal. 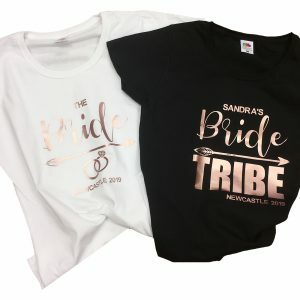 The Bride & Bride tribe t-shirts available to purchase in different style t-shirts. Featured photo showing our fabulous rose gold print. 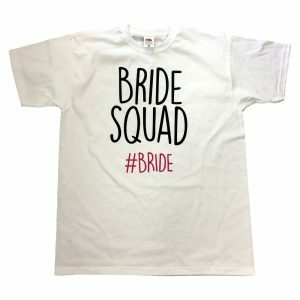 Personalise this t-shirt with the Bride’s name and location of the hen party. 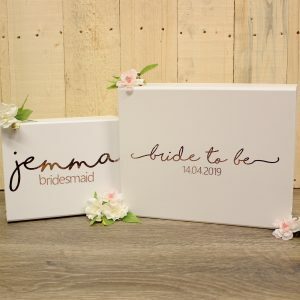 This beautiful snap shut gift box is a perfect way to say thank you to your bridesmaid for being with you on your special day.